LAB Fit is a software for Windows developed for treatment and analysis of experimental data. OptiVec for Borland C/C++: Assembler-written library of vector and matrix functions, 2-3 times faster than compiled C/C++ code: Math, statistics, analysis, FFT, matrix inversion, decomposition, curve-fitting - in total more than 3500 functions. OptiVec for Delphi 2005: Assembler-written library of vector and matrix functions, 2-3 times faster than compiled source code: Math, statistics, analysis, FFT, matrix inversion, decomposition, curve-fitting - in total more than 3500 functions. OptiVec for Delphi 2006: Assembler-written library of vector and matrix functions, 2-3 times faster than compiled source code: Math, statistics, analysis, FFT, matrix inversion, decomposition, curve-fitting - in total more than 3500 functions. OptiVec for Delphi 4: Assembler-written library of vector and matrix functions, 2-3 times faster than compiled source code: Math, statistics, analysis, FFT, matrix inversion, decomposition, curve-fitting - in total more than 3500 functions. OptiVec for Delphi 5: Assembler-written library of vector and matrix functions, 2-3 times faster than compiled source code: Math, statistics, analysis, FFT, matrix inversion, decomposition, curve-fitting - in total more than 3500 functions. OptiVec for Delphi 6: Assembler-written library of vector and matrix functions, 2-3 times faster than compiled source code: Math, statistics, analysis, FFT, matrix inversion, decomposition, curve-fitting - in total more than 3500 functions. OptiVec for Delphi 7: Assembler-written library of vector and matrix functions, 2-3 times faster than compiled source code: Math, statistics, analysis, FFT, matrix inversion, decomposition, curve-fitting - in total more than 3500 functions. OptiVec for Visual C++: Assembler-written library of vector and matrix functions, 2-3 times faster than compiled C/C++ code: Math, statistics, analysis, FFT, matrix inversion, decomposition, curve-fitting - in total more than 3500 functions. 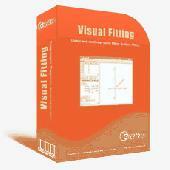 DataFit is a tool for performing curve fitting, statistical analysis & data plotting. Fit equations with up to 100 parameters to data with up to 20 independent variables. Define your own equations or choose from over 600 pre-defined equations. DataFitX is a COM component (in-process ActiveX DLL) which allows you to add a powerful nonlinear regression (curve fitting) engine to your software with just a few simple lines of code. Curve direct is a software intended for all people seeking to view the behavior of automatic breaking devices placed in cascade in a LV electrical network. Curve direct is used to view coordination between devices. This tool therefore enhances the level of continuity of service of an installation. NLREG performs nonlinear regression and curve fitting. EnzFitter is a generic curve-fitting package which has custom features designed to make it especially suitable for analysis of enzyme kinetics experiments. For example, initial rate and parameter values can be obtained with their confidence limits for single and twin substrate rate data. GraphPad Prism is a highly efficient tool capable of doing all mathematical calculations as well as graphical plotting such as curve fitting. GraphPad Prism is a highly efficient tool capable of doing all mathematical calculations as well as graphical plotting such as Curve Fitting. It’s not just an ordinary application that makes plotting easier, but also a powerful one that can be utilized even for the superior purposes such as scientific graphics. CurveExpert is a comprehensive curve fitting system for Windows. Now you can save time with TableCurve 2D - a linear and non-linear curve fitting program. Simfit is a computer package for simulation, statistical analysis, curve fitting and graph plotting using models from a compiled library or from ASCII text files supplied by the user.